I sadly didn’t get to meet any other Derby peeps cos Dave was meant to text my number to Mandy but he probably fell asleep or something. Me and Ele started walking at 11am and got to Hyde Park at around 3.30pm. We marched just over six miles in that time so that gives you an idea of how slowly the march progresed because of the sheer numbers. Little did we know we’d have to walk halfway back to St. Pancras too… my god, how long is Oxford Street? We’re both exhaused but very pleased we went. Apart from the historical significance (which no-one could have predicted – who can guess how many will turn up? 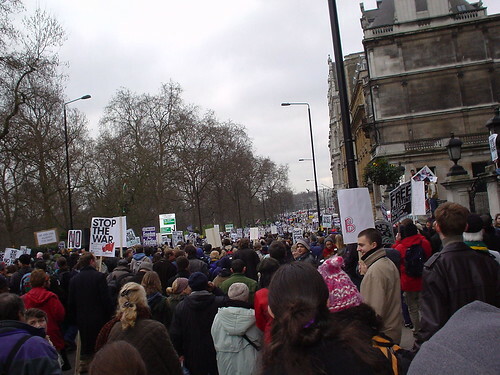 ), we were just glad to be two more people there showing Blair he’s entirely misjudged the mood of the British public. Going home, St. Pancras was full of demonstrators too and it was a bit strange getting on a normal train and 95% of passengers being demonstrators. It was never that politicised even back in the 80s. If you want to see some pics click here!